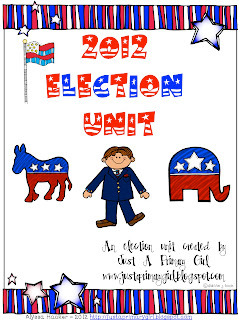 I wanted to share my election unit plan. I couldn't find anything that could fit my kiddo's needs exactly, so I made my own. I teach in VA, and many concepts we don't cover. I used the amazing Krista Wallden's clip art pack! I also tried to make my own clip art! When you look, I did the white house clip art. I drew it, scanned it and make it a jpg!!! It was NOT easy, and I will NOT be trying it again in the future. I will leave it to aces like her! I hope you like it, oh and if you leave me a comment, I will send the first two comments, a copy for FREE. Enjoy!!! I've always wanted to make my own clip art, but I wasn't sure how to do it. Good Job! Just wanted to let you know....you've been Boo-......so stop by my blog and link up and join the party!! Such an adorable blog! I am your newest follower! Please stop by my blog as well! I can't find where to follow you???? I am your newest follower on TPT.